Raincloud Press is excited to announce we have booked Bahni Turpin to narrate the audiobook version of House of Rougeaux! Turpin is an established voice actor with many titles and awards under her belt. Two of her latest titles are The Hate U Give by Angie Thomas and The Underground Railroad by Colson Whitehead. Turpin has an astounding range of voices and accents; we are so grateful she accepted this project. She’s listed on Audible’s Narrator Hall of Fame. We are working with Mosaic Audio in Los Angeles, who are have been graciously working to get this project done for our January deadline. We plan on releasing the audiobook simultaneously with the print and ebook versions on April 24th, 2018. It will be an unabridged version of House of Rougeaux, to be published on Audible, iTunes and wherever audiobooks are sold (and will also be available in some libraries). Audiobook Narrated by Bahni Turpin, available April 2018. Bahni Turpin is a native of Pontiac, Michigan, now residing in Los Angeles. Turpin has narrated over seventy audiobooks, and she is also an acclaimed actress with many theatre, TV and film credits. Turpin has won many awards for her audiobook narration, including the audie award for best fiction narration (for the title Sister of Mine). For a list of her film and TV credits, see IMDB.com. The revised ARC has arrived! 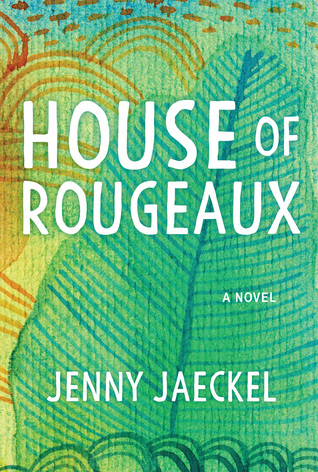 House of Rougeaux by Jenny Jaeckel is publishing in April of 2018, and we have a second addition of the ARC with an updated cover as well as a corrected interior. Still, the art and text may not be final. But at least the text is not riddled with typos! Books came by freight today packed on a small pallet. No one was at the warehouse (it was lunch time!) so I had to hustle down there to meet the truck driver. Which also meant there was no muscle besides my own to load the books in my car to go back to the office. 300 books in total added up! After school, my kids helped make a christmas tree out of books. Why not? House of Rougeaux is the right color for it. All the giveaways on Instagram, Goodreads, and LibraryThing from December onward will be getting this new edition. If advance reviewers find any mistakes in this version, please let me, the publisher, know (Erika Lunder, raincloudpress @ gmail dot com); that would be so helpful. Also, we’ve been looking for any reviews of House of Rougeaux to be posted after March 1st if possible. If you’re an independent book blogger and want to be part of an official blog tour, let us know! We’ll get you on the schedule. In moving prose, House of Rougeaux weaves a multi-layered narrative that celebrates the Rougeaux family truimphs while exposing the injustices of their trials. As each new member of the clan takes the spotlight, a fresh piece of the puzzle is illuminated until at last, after a span of nearly two centuries, the end brings us back to the beginning. It starts with siblings Abejé and her Adunbi, to whom home is the slave quarters of a Caribbean sugar plantation on the Antilles Island of Martinique. Under the watchful eye of their African mother, they thrive despite what threatens to break them. After a night of brutality changes their lives forever, their strength and extraordinary bond carries them through. Award-winning author Jenny Jaeckel masterfully blends genres of coming-of-age and historical fiction with explorations of gender, race, and sexuality, creating a wondrous and harrowing tale of hope and healing.